Naomi’s Blog | Naomi Mitchum | Naomi writes about disability issues and emergency issues that are of interest to churches. She also writes fiction, non-fiction and plays. Once I became aware of microagressions and the effect they have on persons (they are those little unintentional slights that communicate a negative message), I asked myself if I was saying them to myself, not out loud but in my head). Not good for my self esteem. I spilled a bottle of liquid medicine, and said, “You crazy do-do bird.” Not exactly a positive message for my self esteem. Then I was surprised at some of my other self talk and self thought. Discovered I need to advocate for myself in the field of mental health. If you live in the Houston area, and haven’t heard the Houston Symphony, consider it now. Their playing of Elgar’s Enigma Variations last night shouted, “World Class,” and besides that it is a classy group. You won’t hear better anywhere in the world, and nothing beats actually feeling the music both inside your soul and in the reverberations from the bass that you can feel in the seat of your pants and your feet. Then there was spectacular and beautiful Hillary Hahn who opened the concert with a Prokofiev violin concerto that used unimaginable percussion cued in to the second. Of note was the frame of huge hanging chimes that required the musician to sit atop a ladder-like structure to strike the pipes. A live orchestra is a visual treat, too, and, after a while, you choose your favorite players to watch. I started my close up player-watch last summer when I went to Herman Park to pick up free tickets to Miller Outdoor Theater orchestra concerts there, and I discovered that the orchestra rehearses about that same time the morning before the evening concert. Eventually, I went early and got to hear the music many times. Music has many powers: it’s good for your body, it’s good for your soul, and besides, it makes a good date. Mine loves taking me there. Just spent several days with the chair of the United Methodist Taskforce on Disability who taught me quite a few things. Ya’ll know I could stand a mountain of learning. Probably most of you already know about QR code, but I’d never heard of it. Best I can figure is it is like a bar code with art – not lines but embedded code that let you put your iphone up to the cute little square and instantly connect to a website. People put QR code on t-shirts, papers, posters, etc. It’s like shorthand for getting to where you want to go. The trick is you have to have an app on your phone that lets you read QR. I haven’t visited the app store yet to find out if it costs, so I’ll keep you posted, or you can comment back and educate me. Sitting on the porch of our Hill Country cabin watching nature at its best with birds all over the place welcoming the day. A great blue heron has a great habit of stopping off on a rock protruding from the Guadalupe River where he waits for the morning catch to swim by for his breakfast. Cardinals are in great plumage, and the Egyptian Geese who live downstream and the wood ducks come up to our island for whatever it is they eat. I wish I could live by the water, so it could work its magic, calming effect. This week I hosted the chair person of the United Methodist Disabilities Task Force who was attending conference and holding audit meetings, and I got to tag along. I was impressed by so many dedicated persons who work to help the persons with disabilities have camp and worship and educational possibilities. The chair person is from Spokane, so we had some good and some bad weather for her making a change from her dry and cooler climate. Three days were sunshine that encouraged the bluebonnets to spring forth. We drove to Kerrville then went back to San Antonio. I’m packing up to drive back to Houston where I have lots of work waiting for me. As you know, when you take a week off, it means run to catch up, or, in my case, wheel on #4 to catch up. Did I mention catching four rainbow trout in fifteen minutes? Several people have asked me how I came to start Ramps’nthings Press, so here it is. Disability materials, although important, do not make much money as the sales are limited, so after trying to sell them, I concluded failure and branched out on my own. First, I had to agree that I would not make any money, so if I broke even, it is okay. Second, I had to have an organization to put them out there, one that sounded like what it really is. Finding a name was not as easy as it sounds as so many domains and names and logos are copyrighted. I came up Ramps, but it had to be more so I added the “things”. My friend K. said I needed a picture of it for a logo, so Homer Caravjal (the greatest graphics designer in the world) developed one that says it without words. RP’s first book was Get With It Spencer about a rooster that needed glasses and kept crowing at the yard light. 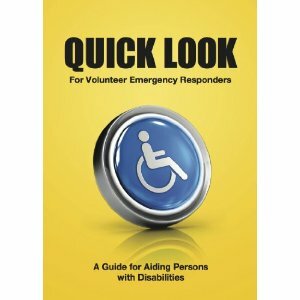 Then came Quick Look for Volunteer Emergency Responders: A Guide to Aiding Persons with Disabilities. Ramps’nthings Press has several things in the almost-finished department including a book of participation stories, another Quick Look book, and a book about change. Just for kicks, I may put my collection of skits and dramas out there, but it needs to be free or at cost. On other front of ramps: I just bought another small suitcase ramp to use at my den door, replacing one built by a carpenter that is too rough and too steep. It is great to have so much helpful equipment available, and this will make my riding much smoother. Lately I have been trying to put into words the importance of spiritual recognition with our students and others with disabilities only to wrestle with word after words. There is no one way to “Evoke God.” God is present. Knowing that may be realized in many ways, different from person to person and group to group. It happens in fellowship, community, planned worship, unplanned moments of discovery, and, in many instances, it happens usually not in cognitive ways. It happens with significant persons who are steady, present and role models in their ways of recognizing and worshipping God. It happens when there is a sacred flow of love and thought. It happens with routine and symbols, and it happens when the senses are awakened and used, and it is important to know your friends in this respect. Music is great for some, but definitely not for persons who are deaf. Colorful worship materials are great for most, but meaningless for persons who are blind. Here is the great importance of using varied ways of worship or God conversations. See how hard it is to use words to describe intuitive knowing? In two paragraphs, I didn’t get it right. Let’s keep working on it. Our prayer circles – the taking of unrushed time that is intentional and celebrated can bring about an intuitive “knowing” of the presence of God. Well, maybe. Maybe not. Who knows? That knowing varies like water that is sometimes still, sometimes rippled and may look stagnant but is not. God’s mix and ways. Be encouraged even if you don’t always see a celebration of the knowing. I am, in fact, the author of this great little pocket book, and it is for sale on Amazon.com, but they have not listed it properly, so I am listing here with the hope that a search engine will pick it up. This small 5 x 7 book made of durable plasticoat will fit into a rescuers backpack or pocket, or its bright yellow color will easily be found on a teacher’s desk or by a church usher. Reviewed ahead of time, then carried to an emergency site, it can save lives when the rescuer can quickly refresh the memory about what to do. For example, it will tell him or her precursors of a seizure or that a person who is having a seizure needs to stay in place, in fact, can do nothing else, but follow up is important. Other details about what to do with persons with disabilities are stated concisely with great graphics to stimulate thinking. Very important picture boards and body pictures help a non person or one who speaks English as a second language point to where they are hurting or what their needs are. Other topics include how to help someone who is homebound, how to deal with loss of power or lockdown and how to safeguard persons post-emergency. In the beginning Quick Look gives the process of quickly communicating, assessing and responding. I’m not telling you this with the hope you will have an emergency, but an emergency can happen any place and any time, and each of us needs to be prepared to help and save lives. Persons with disabilities need a little extra help, and you can find out what kind of help that is. What is your latest emergency? House fire, running out of milk for your cereal on Sunday morning, helping a person at a car wreck (how did you know they were disabled? ), hurricane or flood (Mitchums are five time winners on this one). Or is your emergency standing up to make a speech and noticing your shoes don’t match? For the shoe thing, it’s too late, for other emergencies, you can prepare. This has nothing to do with my book, but one of my funny emergencies happened because I am diabetic and was trying out some new doctor-suggested liquid glucose. Scene: Sitting on the stage in front of hundreds of people waiting to make a presentation after two others finished. They talked too long, and my blood sugar dipped, so I pulled out the little tube and squirted some glucose in my mouth while holding a paper in front of my mouth. The sticky glucose, which turned out to be red, stuck to my hands and to my paper. I could not turn loose of the paper. And I had a new color of sweet lipstick. Saved by the bishop just as I was wondering what and how. He called lunch, and my speech could be afterwards. Diabetic readers will have stories to share. My friend Jim’s Daily Awakenings is right on target about what it means to grow old. I have an idea to add to how I feel about growing old. Well, thank you God, I am growing old. We hear a lot of advice from youngers about what we should have done to prevent disease and creaks and groans, but I am standing up to defend us oldsters. Old people don’t need someone to tell them that they are sick because of choices they made or stresses they have. With diet, exercise, worthwhile activities, prayer–a wholesome life–people get sick. Old age is wearing out. Some wear out sooner than others. What is, is. I felt better when I quit letting anyone intimidate me about why I am sick or about wrong choices I made. What is, is means doing the best with what I can now do, and celebrating life without looking back at mistakes. The forward lens is much cleaner than the backward lens, but I have to admit it is an adventure requiring creativity. We were all created with creativity by a creative God of with.